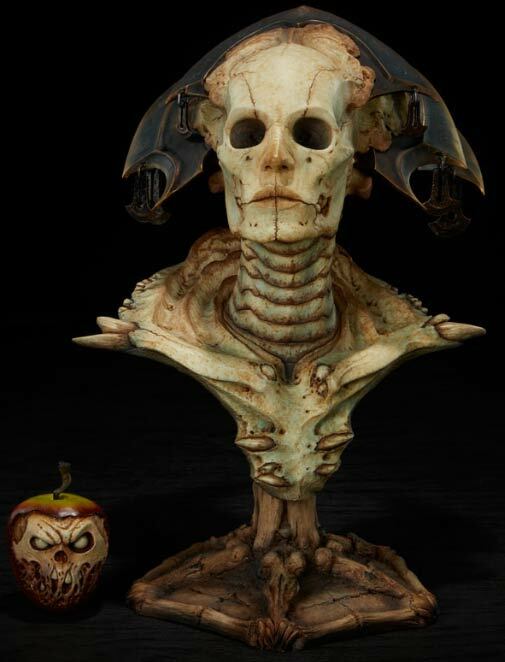 This Xiall: Resolve of Bone Legendary Scale Bust is the newest addition to the original Court of the Dead collection. Xiall, the Great Osteomancer and leader of the Faction of Bone, is Death’s right hand and the most powerful administrator in the Land of the Dead. This highly detailed third-scale bust portrays this haunting character in all her quiet glory. “We are basically looking into the face of a beautiful woman that has no eyes in her eye sockets!” said Amilcar, of this bust’s unique expression. “Eyes are the windows to the soul… They say. So how to give the sense of soul to a character that has no eyes?” Amilcar certainly found a way! At this compelling larger scale, Court of the Dead fans and Bone Faction devotees can shudder at the chilling countenance of this harsh Underworld fixture. The Xiall bust stands a stately 16 inches tall. The Bone Faction leader’s imposing visage is perched atop an elegantly macabre clawed base. The stately iron crests that crown Xiall’s head are ornately decorated with cryptic symbols and peculiar ornaments.